Pages Rock – Chesapeake Chapter U.S.L.H.S. 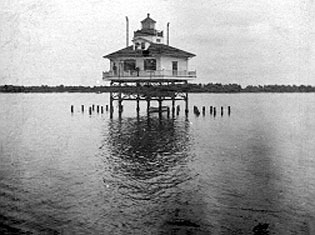 Pages Rock Lighthouse was built in 1893 in the York River off of Blundering Point, Virginia. This was about 5 miles north of the town of Yorktown. It was a hexagonal screwpile lighthouse with a fourth order Fresnel lens and the tower was constructed on the roof. The lighthouse was assembled at the Lazaretto Depot in Maryland. The lighthouse was automated in 1960 and deactivated and removed in 1967. It was replaced with an automated steel skeletal tower built on the original foundation.